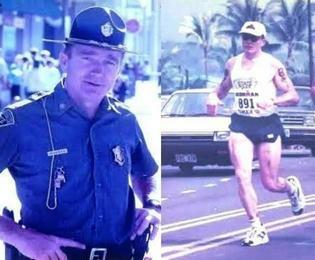 The 64-year old Massachusetts State Police detective-lieutenant has 42 years on the job, but his resume also includes 35 finishes of the iconic Patriots Day race. Stoughton’s Bill Coulter, a 42-year State Trooper, is the king of South Shore runners, having compiled a streak of 32 consecutive Boston Marathons. The 64-year old Massachusetts State Police detective-lieutenant has 42 years on the job. But his resume also includes 35 finishes of the iconic Patriots Day race. Coulter will add to those numbers Monday when he rambles out of Hopkinton for the 120th running on the road to Boston. ‘The streak is real important to me,’ said the 5-foot-11, 170-pound trooper who has also completed 23 Ironman Triathlons, and all 23 marathons held at Disney World, and continues to shuffle along on a replaced hip courtesy of a serious accident when he was hit by a car riding his bike some 10 years ago. Amazingly, Coulter doesn’t run a single step until race day, training by walking in average of 24 miles a week. But it all came perilously close to ending in 2005. In fact, it seems miraculous that Coulter is even alive, let alone adding to his marathon totals. It paints a picture of the resiliency and perseverance. ‘In 2004 I was diagnosed with throat cancer and the doctors told me that my prognosis was dire. I was treated at the Dana-Farber and, when I was first diagnosed, I asked them about running my marathons. Of course they’re giving me a look out of the side of their eye. Is this guy stupid, or does he just not hear us?’ said Coulter in a voice that carries a hint of a rasp. The doctors were adamant. They told him that there was no way he would be able to run. But, in December of that year, after coming to the realization that their patient didn’t exactly fit into the usual mold, the doctors decided to give Coulter his best Christmas present. ‘The docs made a decision. They said if you think you can run, we’re going to allow you to do that. And more importantly, they wanted me to do it. My doctor, Marshall Posner, was the chief head-and-neck oncologist at Dana-Farber. He said, ‘Well if you’re going to do it. I’ll do it with you.’ And that was pretty good support by a doctor to gear up for a marathon with his patient,’ said Coulter. The doctor ran right alongside his patient-partner, who ran with a feeding tube. ‘I couldn’t eat anything orally and had lost over 50 pounds’ along with a nutritionist, and supporting crew of friends, slowly made their way to Boston stopping at every water stop so that Dr. Posner could inject water and Gatorade with a syringe into Coulter’s feeding tube. Amazingly, they finished the race in a qualifying time of under six hours keeping alive the streak. But the doctors weren’t the only ones amazed by their marathon-running patient. His fellow troopers were similarly stunned about his recovery as witnessed by the bronze plaque that hangs on the wall outside the entrance to the gym of the Framingham State Police Headquarters where Coulter is stationed. It reads: Detective Lieutenant William Coulter Fitness Wing. ‘I said, sure, I got a kick out of it. When they had the memorial mass they actually expected me to be one of them. But fortunately it didn’t get to that point. In fact when we have events at the headquarters, I like to say to whoever is at the event, I’m glad you came to use my memorial gym today,’ he said with a laugh. In all the years that Coulter has traveled over the marathon course he said nothing could top what he and a fellow trooper experienced when they escorted the legendary Johnny Kelley, twice a Boston winner (1935, ’45) to the finish line something they did six times between 1990 and ’95: three times for the entire distance, and three other times from his statue located on the corner of Commonwealth Avenue and Walnut Street in Newton. ‘Johnny Kelley was a character, but he could be awfully cantankerous, especially as he started getting older (The legend completed his final Boston, his 61st, at the age of 84). The BAA (Boston Athletic Association) was concerned for his safety and (the State Police) told them that we can protect him. A trooper can run behind him and one can be next to him. There will be zero time that he’ll be alone and, if anything were to go wrong, we are all professionally trained, and they agreed,’ said Coulter. Among the countless stories that Coulter has regarding Kelley, the most memorable occurred during his last full marathon jaunt and involved a pair of false teeth. ‘On his final full marathon, we’re escorting him and he’s really cantankerous, complaining about everything. As we’re going through Natick he stops over by the side of the road, takes out his teeth and hands them to me. I said, no way Johnny! Stick ’em back in your mouth! I’m not carrying your teeth! And that’s what he did,’ said Coulter with a laugh. At Kelley’s funeral Coulter, along his fellow running trooper, symbolically walked the casket in and out of the church the same way they escorted him during his races.